Course | Christoph Bartneck, Ph.D. I gave another seminar on how to write and publish effectively and efficiently. We talked about the writing process in Word, how to use LaTeX for the layout and how to survive the review process. 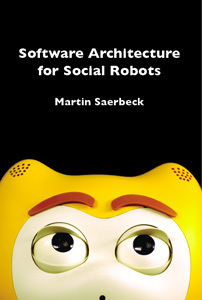 Martin Saerbeck’s PhD thesis “Software Architecture For Social Robots” is now available online. Martin defended his thesis on December 10th, 2009. He did an excellent job at answering all the questions of the committee. The goal of this master class is to create expansion packs for the Lego Mindstorms NXT product. The student follow a series of lectures on the underlying technologies and in the end design and build their extension pack. An Efficient Publication Process from Christoph Bartneck on Vimeo. In this video, we introduce an efficient publication process. It starts with structuring thoughts, and assembling all the elements in a text editor. Next, we demonstrate how manage references and how to include figures. Last, we demonstrate the usage of Latex to automatically layout a document. Visual Design (Part 3) from Christoph Bartneck on Vimeo. Session three deals with the composition of elements in space, proportions and contrast. In addition, we talk about page grids, page breaks, tables, figures, and bibliographies.